People, relationships, and the shared stories that bind them together are at the heart of every family. Because of this, it is important to preserve the personalities and life-stories of those we love before time takes them—and our memories—away. A Mini Biography from Life. 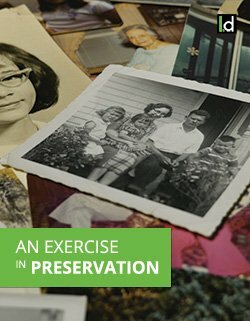 Documented provides a simple and compelling way to insure that the people, stories, and traditions we cherish are available to future generations of family. Every family has at least one person in their metaphorical tree that looms larger than life. Such individuals have a story to tell—but it is not their’s alone to be told. A Biographical Documentary from Life. Documented is a legacy piece—a work of art—comprised of various interviews and media. It is a priceless tapestry of history and anecdote whose aim is to communicate a compelling story about your loved one. If you have children, you know they grow up fast. One minute they’re spitting up on your shoulder and the next minute they’re asking you to borrow the car. Between these moments is an ever-changing personal history of thoughts, expressions, and mannerisms. If not recorded, the specifics of these changes are lost to time. A children’s video interview is an easy and convenient way to capture and preserve these moments for you and future generations of family. Time flies. Before you know it, your bouncing baby boy or girl is a high school senior. What will you do to preserve this defining moment for others to share and remember? Peer behind the veil and ask your senior the questions that matter most to you. Watch your son’s face light up as he discusses his taste in music or listen to your daughter discuss her life and career as she envisions it in ten years. Senior pictures are valuable, but a senior video interview from Life. Documented is priceless. When loved ones pass, the world changes. Memorial videos allow us to reflect on what it was that made our loved ones special and give us the ability to pass these memories on to future generations of family in a tangible way. They can be simple or complex and range from general photo slideshows to a collection of different media. Legacy videos allow loved ones to speak to those they are leaving behind while they are still yet living. Such videos are presented to family upon passing. Congratulations! You’ve decided to start a new life together as husband and wife. During this time of celebration it’s common to document the occasion with engagement photographs. Though special, photographs will never be able to tell your full story; however, an engagement interview from Life. Documented can. Independently describe on camera how you met or where you see yourselves in five (or fifty!) years. The choice is yours! Re-live the moment and reflect on why it is that you love each other so. Do you have questions? If so, feel free to contact us using the form below or give us a call at 770.756.0031. We look forward to hearing from you!